The boundary cannot be determined by the Land Registry alone as this is based on Ordnance Survey maps which have tolerances (dependant on scale) and are shown only as general boundaries and which may not coincide with physical features “on the ground”. Deeds (generally referred to as the “paper title”) are an essential part of the process in discovering the legal boundary which, with other documentation, needs to be examined closely (there are not always plans). The Deeds to the property are generally held by the owner, their solicitor, or the mortgagor but the Land Registry may also hold deeds on file or electronically on which they have based their title plan, although not always the case. Historical maps and photographs, if necessary, are also used to determine boundaries with comparison with old and current buildings/features on the ground. 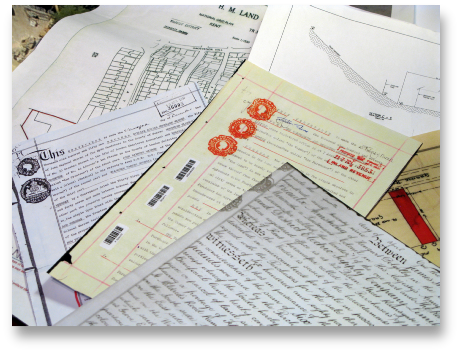 Interpreting the meaning or the maps, deeds and document is a skill associated with experience which we can offer. 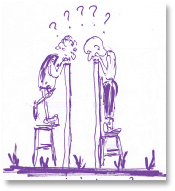 Adjoining Owners may just wish for a professional third party to agree where they have already jointly considered the boundary to be and for the relative plans to be drawn up and registered with the Land Registry. However, boundary disputes arise for a number of reasons and can sometimes be accompanied by other matters in dispute between adjoining neighbours. It is the surveyor’s role to determine the nature of these disputes and to resolve the boundary matter (if instructed jointly) or along with his counterpart surveyor of ‘the other side’ together with the physical features on the ground and the paper title (the Deeds) and other documentation. Most boundary disputes can be settled by the surveyor(s) without the need for attending court as this is based on factual evidence and his/their experience in interpreting old maps, plans and photographs. We will be happy to offer a half hour free telephone consultation to discuss your problem which can sometimes be all that is required to resolve the situation. If this is not the case we can offer advice on the next steps to take (not necessarily with our involvement) and will ask you to call back with the outcome. Should this be unsatisfactory we will, on your instructions, meet you and take the matter further, hopefully to an amicable conclusion. This can involve just the examination of the deeds and a simple survey but it may also involve in-depth investigations with a full topographic survey of the area concerned. We will, however keep you informed at every step of the process as to the the likely outcome.